But for some, these pouches can become painfully inflamed or infected, requiring treatment with antibiotics—or, in serious cases, surgery to remove the colon. At present, no one knows what causes diverticulosis (the formation of those pouches) or diverticulitis (inflammation of the pouches). Lillias Maguire, M.D., a colorectal surgeon at Michigan Medicine, wasn't satisfied with typical explanations for the common inflammatory disease, which causes more than 200,000 hospital admissions each year in the United States. "The prevailing suspicion was that it is caused by diet," Maguire says. 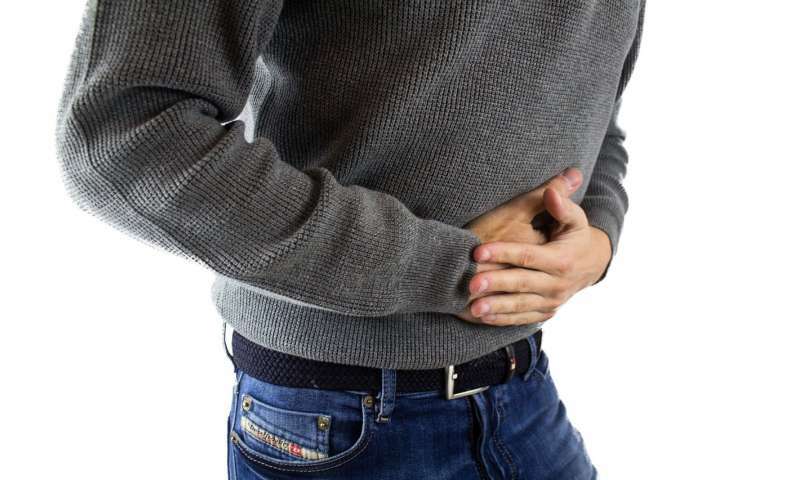 "It's been thought that diverticulitis might be linked to low fiber, since people consuming a typical Western diet are relatively constipated. "However, when you look more closely, this explanation doesn't appear to shake out." To find out more, she approached Elizabeth Speliotes, M.D., Ph.D., an assistant professor of gastroenterology, internal medicine, and computational medicine and bioinformatics who has been heavily involved with genetic studies of multiple different disease states. Speliotes mentored Maguire through a genome-wide association study to hunt for genes underlying the condition. The study is published in the journal Nature Genetics. Genome-wide association studies, or GWAS, are a relatively new and powerful tool for looking at the genetics of complex conditions that have both a genetic and environmental component and are not passed down directly from parent to child. These studies rely on the availability of large collections of genomes—and the bigger, the better. "There's no way to do true GWAS in a cohort of 1,000 or even 5,000 people simply because the genome is so big," says Maguire. Fortunately, such a collection exists in the form of the UK Biobank, which contains the genetic and medical information of more than 500,000 people between the ages of 40 and 69 years old. It's an unprecedented resource that scientists from all over the world turn to in an attempt to unlock the genetics behind common diseases like heart disease, cancer and dementia. In this instance, the data had potential. "Through medical records, we know that about 28,000 people in the UK Biobank were admitted for diverticulitis," Maguire says. With help from Speliotes' lab, she compared those people with a cohort of about 31,000 people from the Michigan Genomics Initiative at U-M. The goal: to find common genetic variants that might identify the potential genes behind the disease. "In a GWAS, we are looking for variants in the genomes unique to individuals that are associated with genes," Maguire says. "They don't necessarily pinpoint genetic mutations but they point us to a region in the genome that has multiple genes nearby." "We then run a massive statistical test to see which variants come out as strongly associated with diverticulitis," Maguire says. But that doesn't mean all 42 are necessarily significant. The sheer size of the sample means some loci are bound to be just noise, she adds. When they compared the 42 loci from the UK Biobank with the Michigan Genomics Initiative sample, eight came out as common between the two groups. "When we see replication of loci across populations, it makes us feel more secure that there is a strong correlation," Maguire says. What's interesting, however, is what the genes they identified are associated with. Within the context of diverticulitis, "the genes we saw seemed to make sense," says Maguire. "We identified genes for connective tissue cells, pathways that we know are associated with other connective tissues, hernia, and other diseases like aneurysmal vascular diseases that are also connective tissue related. We see this and start to think, 'OK, we're hitting something good." The analysis offers new and useful insight on diverticulitis. Thirty-nine of the loci Maguire's team found have never before been identified. Maguire believes they have the potential to serve as a starting point for finally explaining the origins of this disease. "Maybe by investigating some of our targets, we might have an answer about why this disease occurs and develop a drug or therapy that works a lot better than just taking out a piece of the colon or giving people recurrent courses of antibiotics," she says. None of these discoveries, the researchers know, would be possible without biobanks. "The people who had the foresight to set up and participate in the Michigan Genomics Initiative have provided and are growing this amazing resource that will enable us to do a lot more studies to really understand what is happening to people—not just with diverticulitis but with other diseases, she says. "This is just the start."